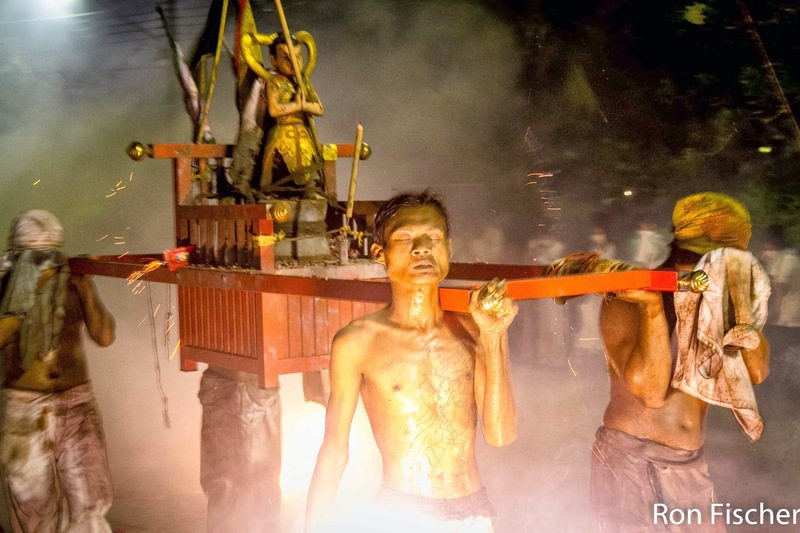 The festival lasts about 10 days and involves thousands of worshipers from Thailand and the region. 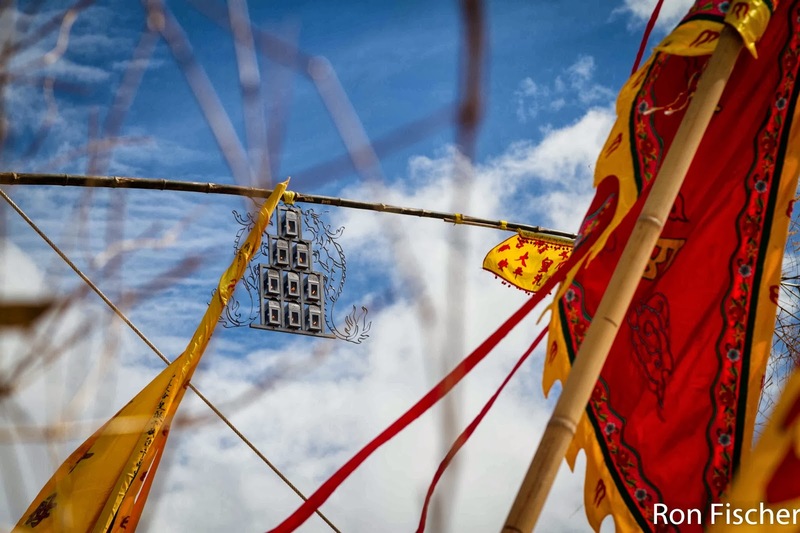 It starts with the raising of a lantern pole which invites some Emperor Gods to descend from heaven. In the following days, believers who act as mediums go into trance and impersonate various gods and warriors. 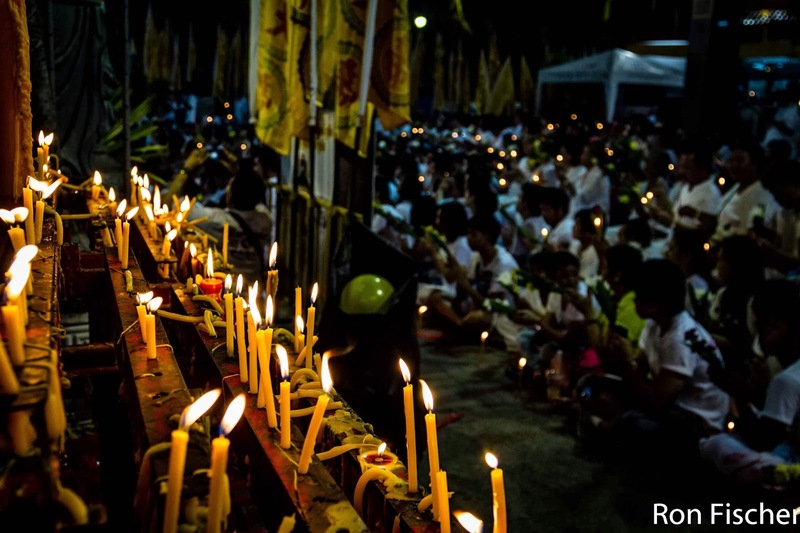 These mediums will walk over heaps of glowing coal and climb bladed ladders (both events have specific religious significance and are performed on days before important events of the larger ritual). The most impressive show of these mediums are the processions though. Starting in the early hours of day, believers will go into trance at the temple which will sponsor and organize the procession of the day. 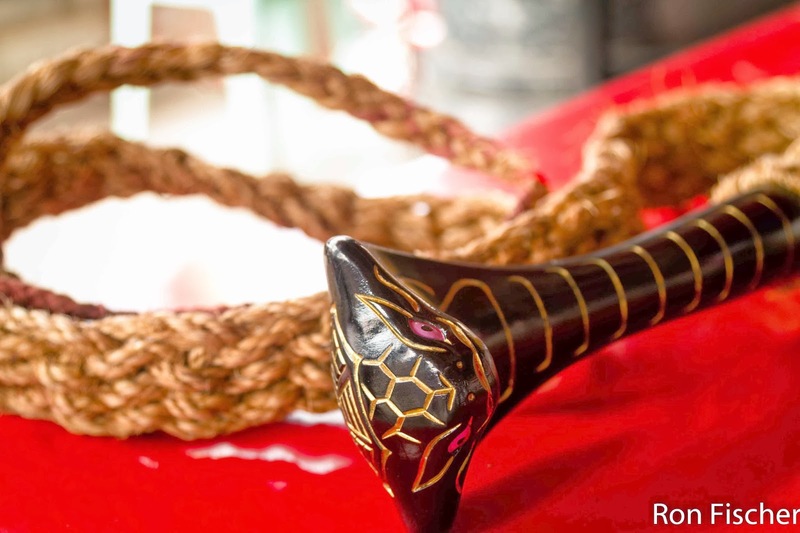 Supporters will dress the mediums (once they are in trance) with the characteristic Chinese style garments and hand them artefacts that show their heavenly power (typically some flag with Chinese inscriptions and a whip with a snake-shaped grip). Depending on the spirits that possess them, a good number of the believers will engage in piercings and acts of self-mortification. 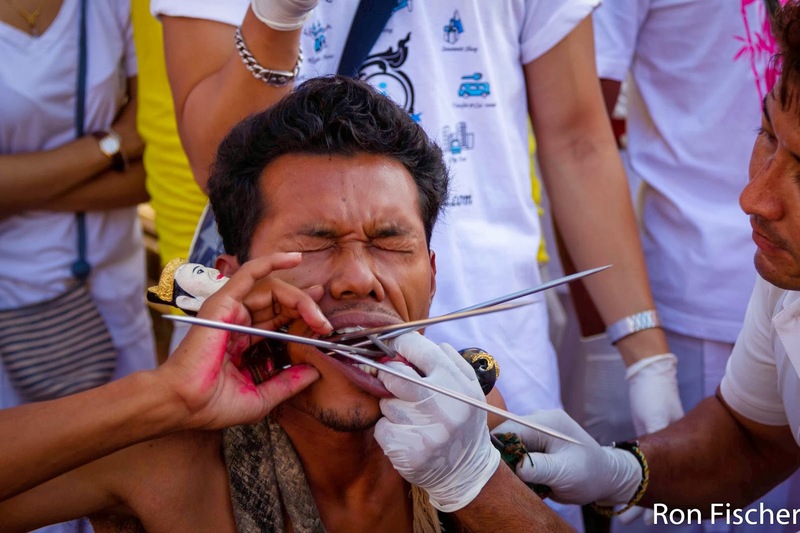 The piercings in some cases can be hard to stomach for outsiders. It ranged from needles and skewers to guns, beach umbrellas, metal saws, swords, tree branches, basket ball hops attached to a car tire, beads and any unimaginable object. I asked how people decide what objects to drive through their cheeks. The answer was that they dream it (the spirit telling them what to do). Apparently, the greater the pain, the more blessing for the individual and the community because this wards off evil spirits (many of the mediums are supposedly fierce warriors that battle evil). There was blood, sometimes lots of it. 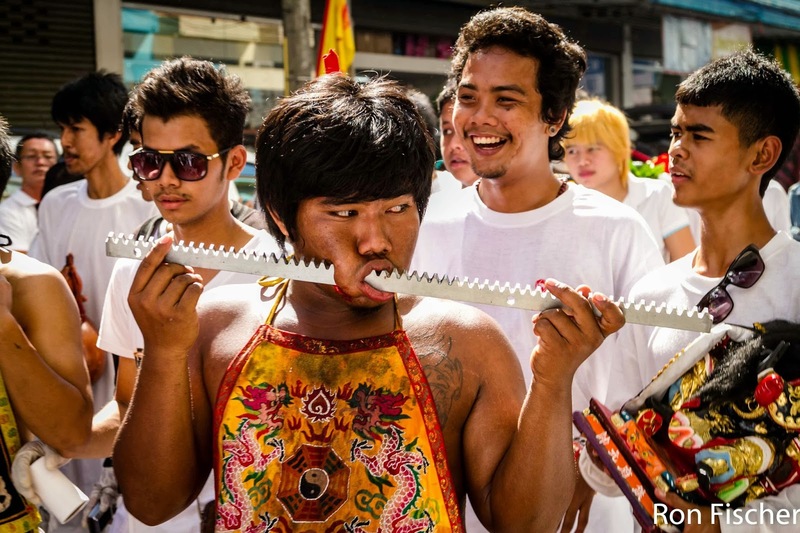 Some were cutting their tongue on swords or hit their back with sharp objects. There were moments when I thought it went a bit too far (I remember one moment when I was wondering whether the weight of the object inserted into a person's cheek would rip off the skin completely from his face - well, it did not and I was glad about that. I spare you the photos...). The mediums parade through town in a procession that lasts several hours (covering up to 20 km in distance). They walk barefoot over hot asphalt in the tropical heat. Onlookers invite them to bless them, their family and their house. 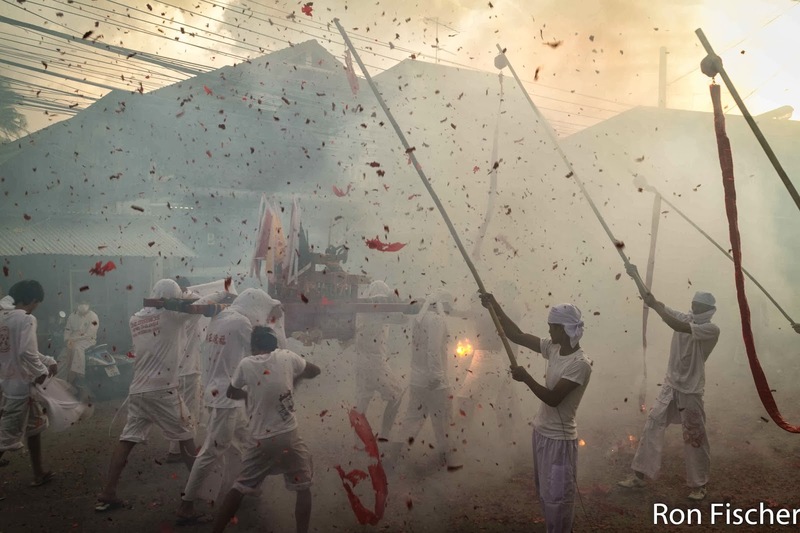 In order to increase the torment, firecrackers are thrown on these mediums, with the belief that the more noise being made, the more fortune for the family. 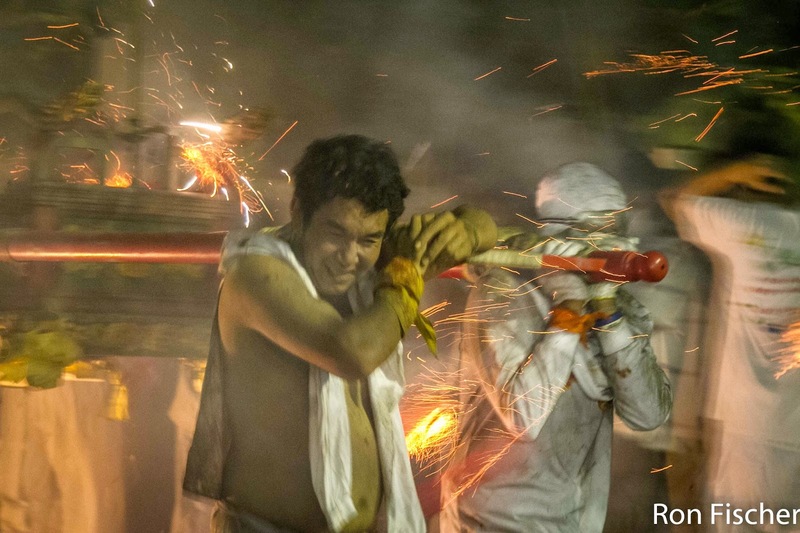 Despite all the goriness of the piercings, the throwing of the firecrackers leading to war-like scenes left probably the most impressions on me. I felt transported into a war zone between aliens from a different planet. 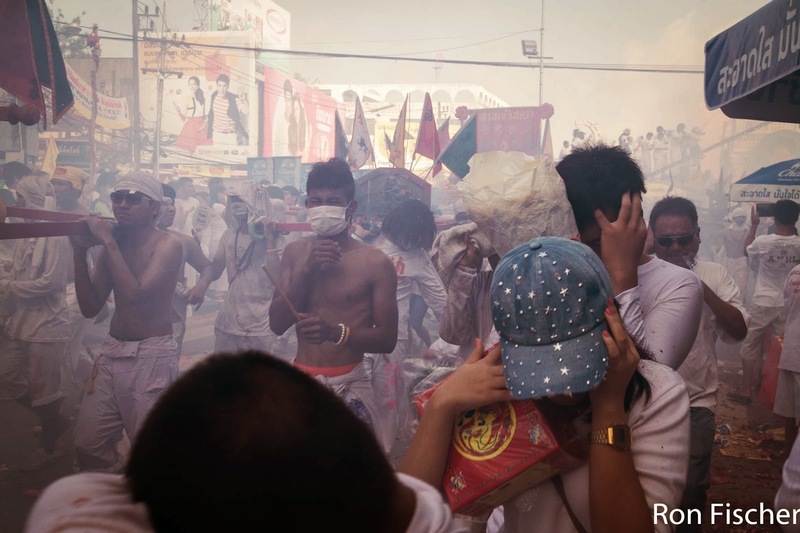 The smoke from the firecrackers made breathing difficult. Visibility was reduced to a few meters, only the light of the firecrackers able to break through the fog. The sound of the firecrackers echoing back and forth between the buildings in the narrow streets. Transported into an apocalyptic war zone, the best protection of my face was to hold my camera and shoot back (photos against firecrackers). It was hard to imagine how people were able to endure this for hours. Trying to shoot photos, I got a few hits from firecrackers. The physical sensation of a firecracker exploding on your back, in front of your face or your bare feet (call me well-prepared for venturing out in sandals) is not to be underestimated. Once back at the temple, the piercings were removed by priests and other participants in the ritual and the spirits were asked to leave (ie. exorcised) in a small ceremony in front of the shrines inside the temple. 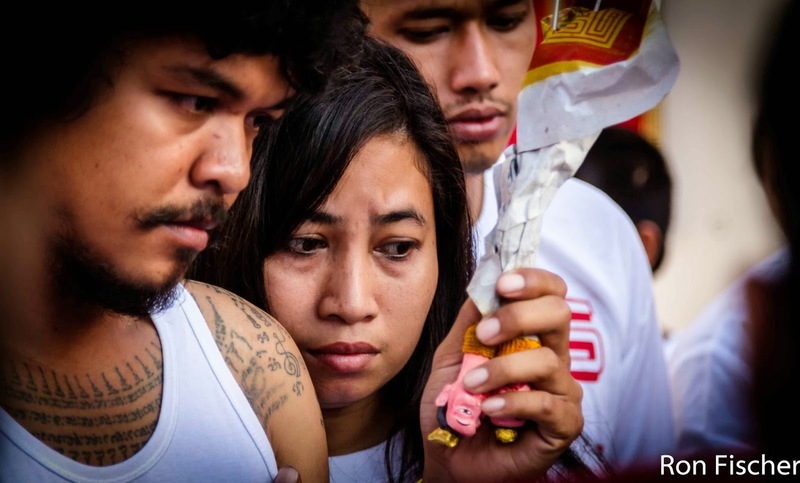 Soon after the procession, there would be more rituals... a non-stop chain of religious rituals and a kaleidoscope of passion, devotion, shared food, blood and ritualistic suffering. 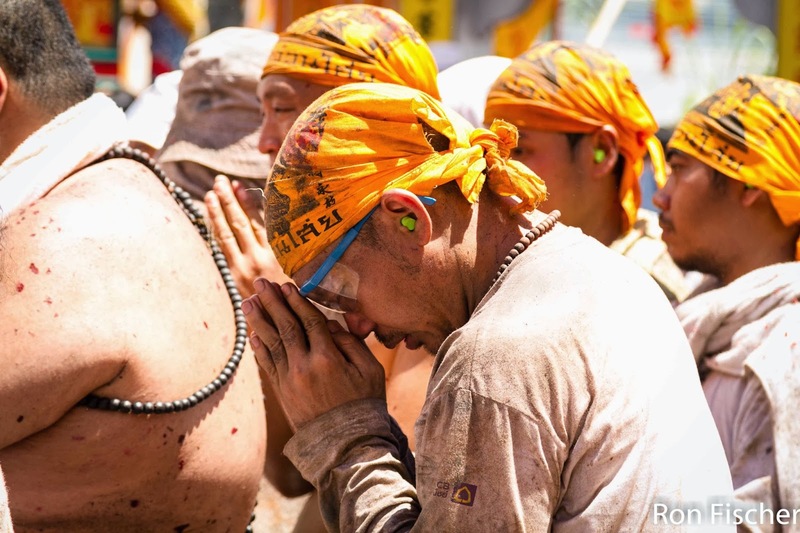 In addition to these spectacular extreme rituals, there are other ceremonies that oscillate to the other extreme of tedium and stillness. One of the rituals called Propitiation of Seven Stars involves the warrior mediums in trance guarding a platform structure where more mediums assembled. The temple community is crowded around in silent prayer. One individual beats a drum monotonously for about half an hour. There is not movement and no sound except the tiny dingdingdingding of this drum for the whole period. Unfortunately, I could not really got more information on what is happening during this ritual beyond some general vague stories. But the contrast between extremes could not have been stronger. Transitions and change were notable. 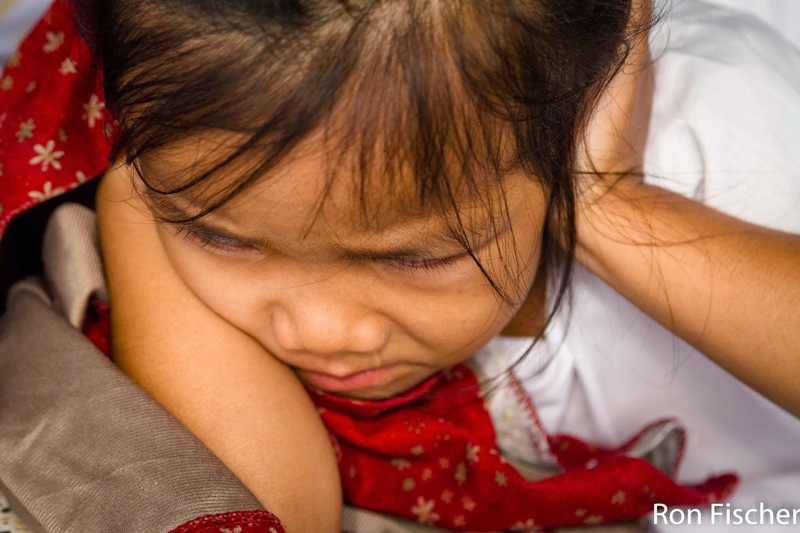 For one, tablets, cell phones and cameras were everywhere to document the extremities. Often it appeared that friends and family of the medium were documenting every single step of the medium, as if to document the suffering to document for posterity. What are these people doing with these documents? Many of the mediums would stop and pose for photos - what is the purpose of this exhibitionism? 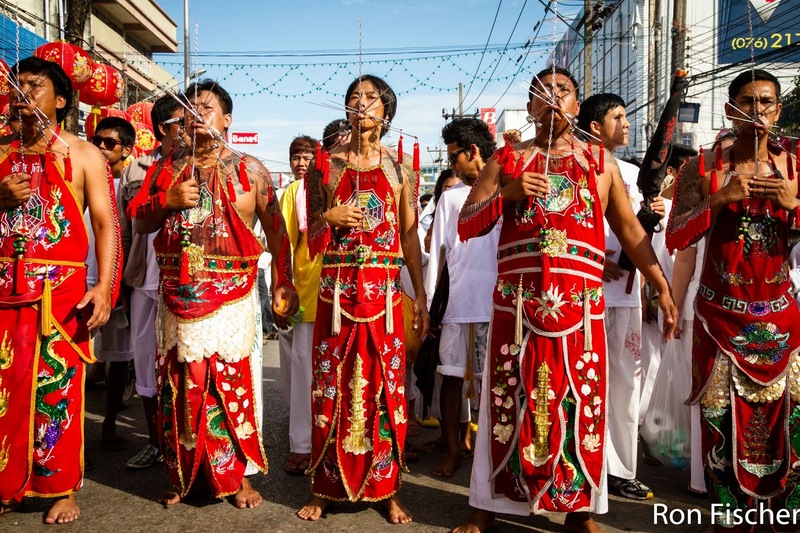 There is a line of research that argues that costly rituals bring communities together and increase the status of individuals who engage in the most extreme forms (see for example work by my colleagues Joseph Bulbulia and Markus Frean). Are these documents used later to increase the status and prestige of the individuals who engage in these activities? Is the posing for pictures a mechanism to increase one's self-esteem? Is the greater shock value of extreme acts translated into social capital within the community? The extreme nature of some of these piercings was striking. I had seen some postings of such piercings before on the internet, but seeing it in person is different from seeing it from the comfortable safety of your computer. There seems to have been a shift towards more extremes. 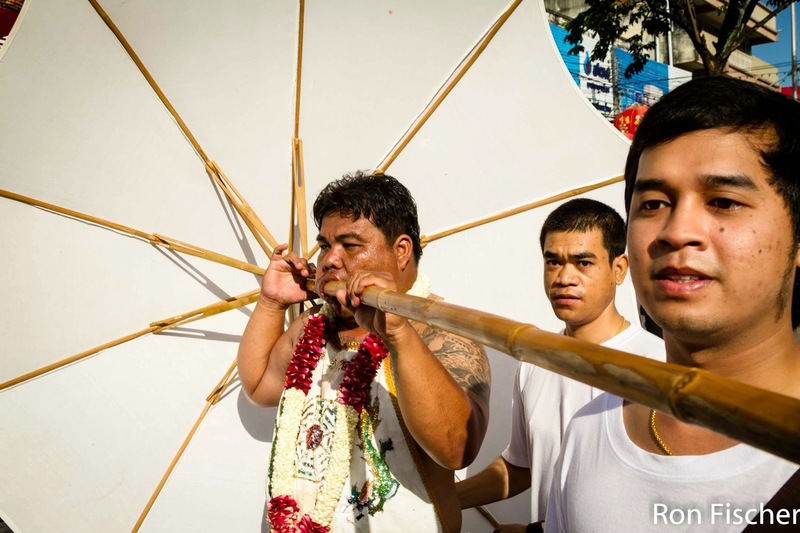 We did some work on Thaipusam last year in Mauritius (a major field site for studying rituals in the field, directed and organized by Dimitris Xygalatas). In conversations with Temple leaders, they commented that piercings and size of the kavadees that believers carry has increased over the years. An interview with a medium from Phuket posted on the internet came to similar observations. The choice of piercings is supposedly dictated by spirits during dreams.... To me it nearly seemed like a ratcheting of extreme actions (think of the 'keeping up with Joneses' effect). To what extent is the posting of extreme piercings, sensational violence, and all sorts of other evidence of self-inflicted harm on internet and global media leading to a 'spiritual arms race'? 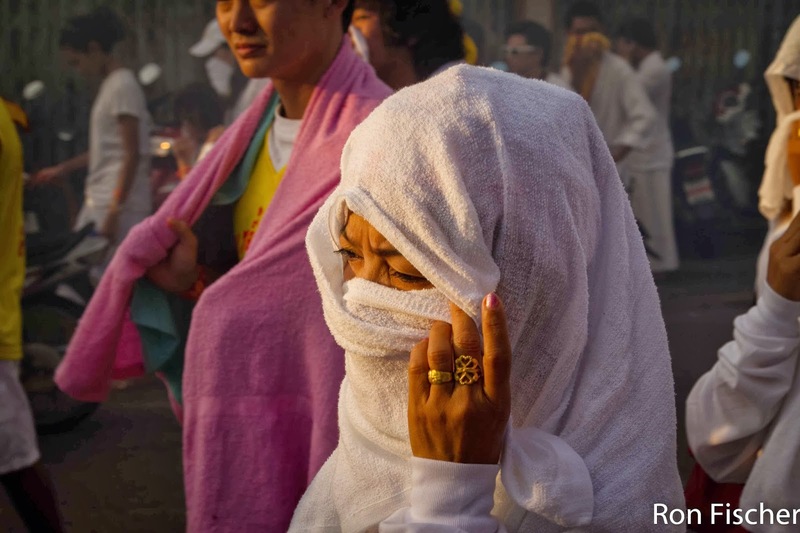 Yet, at the same time, other changes led to changes in the rituals. Blade-walking and bladed ladder climbing used to be a significant part of the ritual. Yet, these practices in the times of HIV are dangerous and can infect a large number of participants. For this reason, a number of temples have abandoned this practice. Some changes were also quite cute. 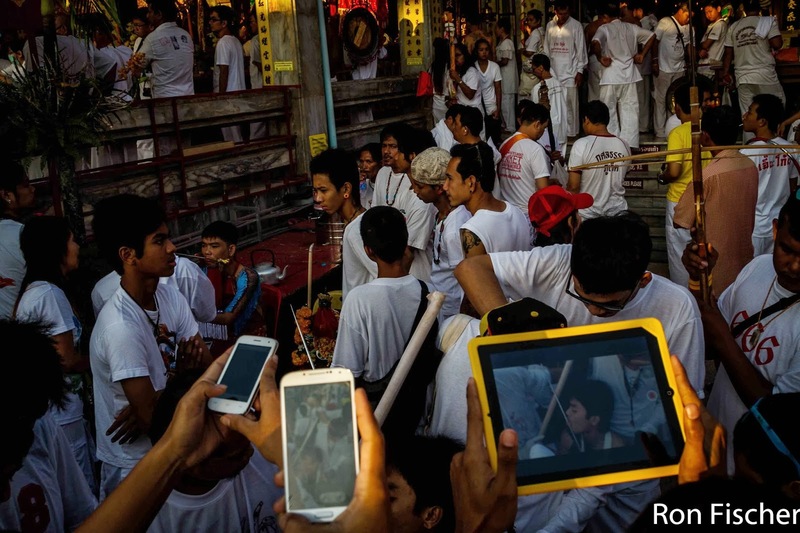 It was fun to see how kids and youngsters went through some of the more boring parts of the ritual by secretly using their cellphones and tablets for entertainment. Some of these folks had devised ingenious techniques for entertaining themselves while pretending to be good believers. In many ways, these simple observations of human reactions during a period that felt so extreme punctuated the humanness of it all. The pained expressions of bystanders, the open eyes in awe and disbelief of some of the suffering that was displayed, the innocent attempts to ward off both shock and boredom revealed the human aspect. It is these small observations that brought it home to me that through the extremity it actually shows the universality of what it means to be human. There will be people who go to extremes for all sorts of reasons in all cultures. There will be pain and boredom in all places. And it is the reaction to these universal elements that reveals our shared humanity. I am glad I went. Many thanks to Janpaphat Kruekaew for introducing and opening this fascinating world for me. Quite often when I was too tired to continue, she tirelessly continued asking people and getting interviews and responses from participants. It was a humbling experience working with her. I am looking forward to going back and getting a better understanding of the minds of some of these people, those who go to extremes and those who just stand by and watch the procession unfold in front of them. Wow this research sounds even more interesting than our methodological paper on research into coexisting anxiety and depression... Seriously, this sounds like an amazing experience and an insight into some cultural practices that most Westerners would find pretty strange. I'll look forward to hearing what your research shows.